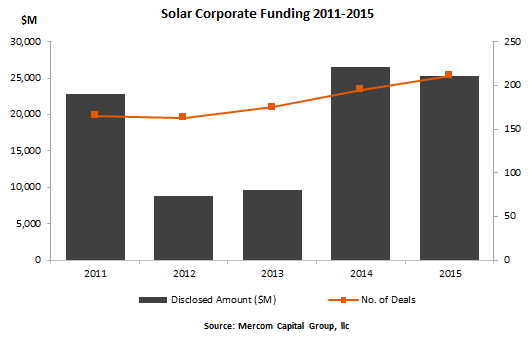 Mercom Capital Group LLC, a global clean energy communications and consulting firm, released its report on funding and merger and acquisition (M&A) activity for the solar sector in 2015. Total global corporate funding in the solar sector, including venture capital/private equity (VC), debt financing, and public market financing, raised by public companies came to $25.3 billion, compared to $26.5 billion in 2014. Global VC investments came to $1.1 billion in 83 deals in 2015, compared to $1.3 billion in 85 deals in 2014. 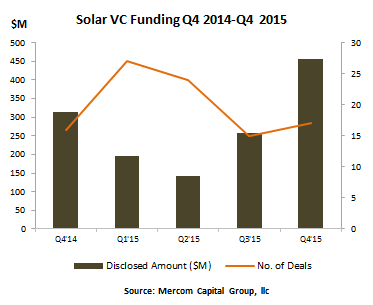 Solar downstream companies accounted for 69 percent of the VC funding in 2015, with $727 million of the $1 billion raised. 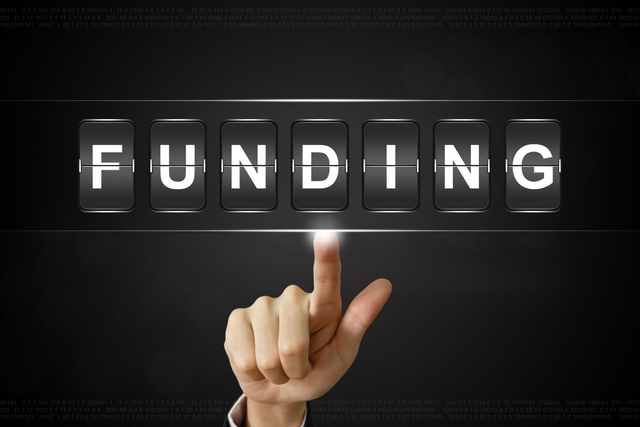 Investments in PV technology companies came to $173 million and Balance of Systems (BoS) companies raised $87 million. Thin-film companies brought in $44 million, service providers raised $15 million, and the CPV and CSP categories each raised $3 million. Over $100 million in VC funding went to companies focused on off-grid markets in Africa, India, and South Asia. Among the Top 5 VC deals in 2015, the largest was the $300 million raised by Sunnova Energy, followed by the $105 million raised by Silicor Materials. Sunlight Financial raised $80 million and Sungevity raised $50 million. Completing the Top 5 was Conergy, which raised $45 million. There were 109 active investors in 2015 with 14 involved in multiple rounds. The 14 were DBL Partners, Infuse Ventures, Bamboo Finance, Clean Energy Venture Group, DOEN Foundation, ENGIE Rassembleurs d’Energies, Hudson Clean Energy Partners, International Finance Corporation, Kohli Ventures, Longwall Venture Partners, MTI Partners, Parkwalk, Tenaska and University of Oxford. Despite a weak fourth quarter, public market financing had its strongest year with almost $6 billion raised in 38 deals, compared to the 2014 record of $5.2 billion in 52 deals. There were seven IPOs bringing in a total of more than $1.8 billion including Sunrun, Xinte Energy, CHORUS Clean Energy, SolarEdge Technologies and Grenergy Renovables. Yieldcos raised $1.1 billion in two IPOs, TerraForm Global Yieldco and 8point3 Energy Partners. Debt financing in 2015 totaled $18.3 billion, slightly down compared to $20 billion in 2014. More than half of the debt funding raised came from China, $10.9 billion in 33 deals. There were four securitization deals in 2015, totaling $335 million, by Solar City, SunRun, BBOXX and AES. Announced large-scale project funding in 2015 exceeded $11.6 billion in 124 deals this year, compared to 2014 in which $14.2 billion was raised in 144 deals. 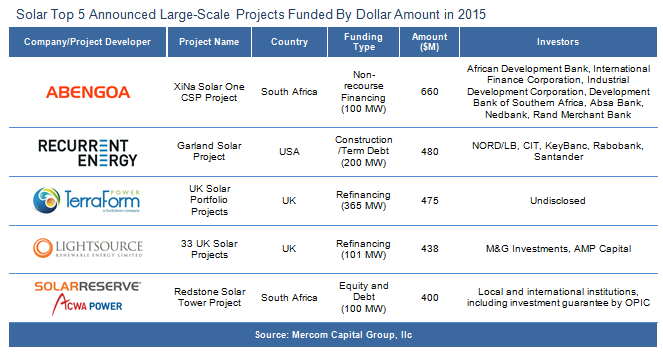 A total of 145 investors funded about 6.6 GW of large-scale solar projects this year. Top investors were Santander with 12 projects, Rabobank with nine projects and CIT Bank, Credit Agricole and KeyBank with six projects each. It was a record year for dollars raised in residential and commercial solar project funds in 2015 with 23 funds announced for a combined total of $5.5 billion, compared to the $4 billion raised in 34 funds in 2014. SolarCity, Sungevity, Onyx Renewable Partners, Sunlight Financial, Brite Energy and Kilowatt Financial were top fundraisers in 2015. “With the ITC extension, we predict third-party owned financing companies will continue to raise residential and commercial funds in large numbers,” commented Prabhu. Since 2009, third-party owned financing firms offering lease, PPA and loans have raised more than $17 billion. Corporate M&A transactions in the solar sector in 2015 came to more than $3 billion in 80 transactions, compared to 116 transactions in 2014 for over $4 billion. 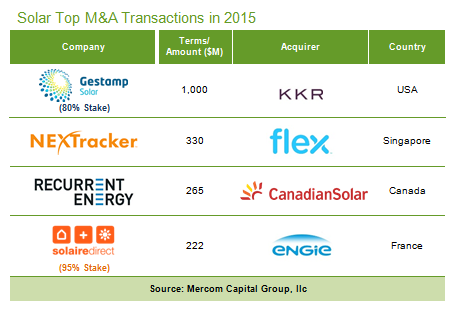 Solar downstream companies had the greatest number of acquisitions with 49 transactions. SPI Solar acquired four companies and Global EcoPower acquired three companies. The largest disclosed transaction was the $1 billion acquisition of an 80 percent stake in Gestamp Asetym Solar from Gestamp Renewables by KKR, an investment firm. There were a record 204 large-scale solar project acquisitions for over 12.7 GW, double that of 2014 where 6.4 GW changed hands in 163 transactions. 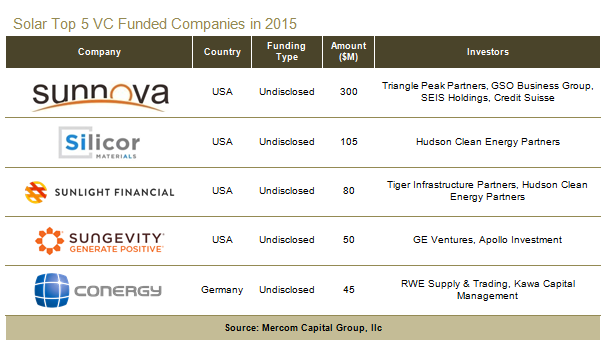 Spurred by yieldcos, 2015 has been by far the best year for solar project acquisitions. Mercom also tracked 373 large-scale project announcements worldwide in Q4 2015 totaling 12 GW and 1,118 project announcements totaling 41.1 GW for 2015 in various stages of development globally.